Petandang--Traveler: Camp Leakey, Me Likey! Camp Leakey got its name from Louis Leakey, Professor Biruté Galdikas' mentor. Louis Leakey was perhaps famous for his "Leakey's Angels", namely Diane Fossey (who studied gorillas in Rwanda), Jane Goodall (an expert in chimpanzees) and Biruté Galdikas (an expert in orangutans). Professor Galdikas (fondly referred as Ibu Professor) first came to Tanjung Puting in the 1970s. She's been studying orangutans since then. Thanks to her continuous efforts, we now know more about orangutans' way of living and habits. Orangutans might live up to their 40s and 50s. Orangutans in Kalimantan are different than the ones in Sumatra, the ones in Sumatra have longer "beards". One adult female orangutan is said to have the strength of 4 grown men. One adult male orangutan is as strong as at least eight men (kings are more powerful, naturally). Adult male orangutans develop cheekpads starting from adolescence, the pads will grow bigger when they win more fights with other males. The cheekpads are very useful when making long calls. The pads are also signs of virility and strength. Orangutans build nests almost everyday to sleep on. In Tanjung Puting area, the guides and rangers will be able to tell you how the nests look like. Orangutans cannot float. They also can't swim. They spend most of their times in the trees, swinging from one branch to another. Females rarely walk, especially the ones with children. Orangutans have a big role in seeds' distribution. By moving from one branch to another, they help sunshine reaching the inner forests, thus enabling more plants to thrive. Female orangutans have 8 months' gestation time. They rarely deliver twins, and usually when they do, at least one will pass away. Baby orangutans are very dependent of their mothers. Moms will breastfeed them up to 5-6 years. Female orangutans usually give birth after 6-8 years. Poachers prefers to hunt female orangutans because they can sell the babies at high price. :( This is very sad, because the loss of one female orangutan means the loss of up to 5-6 baby orangutans. 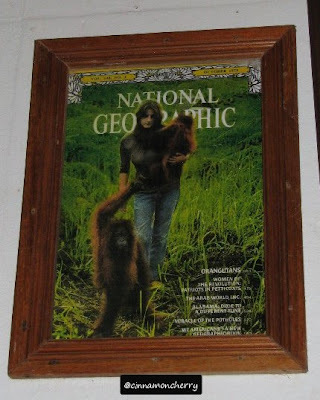 Ibu Professor has appeared twice, IIRC, in National Geographic's cover. This is Ibu Professor, in 1975. Gorgeous! Ibu Professor usually stays in this lodge whenever she is in Tanjung Puting. 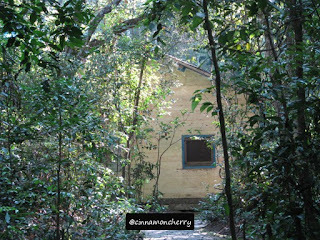 It is located in Camp Leakey. These days, Camp Leakey is quite modernized. There is a walkway made of ironwood to this area. 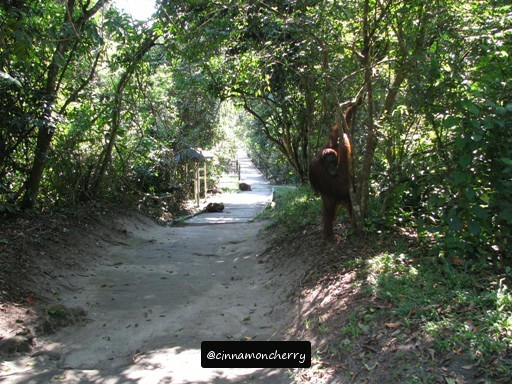 Do not be alarmed if you see plenty of orangutans walking next to you! They are usually more anxious to get extra food in feeding area than disturbing you. Maintain your distance, at about 5 meters away from them. The guides and rangers will tell you what to do. There's also an information center with tidbits and highlights about the forests and their flora & fauna, also family trees of orangutans in Camp Leakey area. You will be able to find pictures of wild fruits that grow in Kalimantan. Some of them look pretty tasty! The feeding time for orangutans is at about 15.00 and visitors are advised to walk the short trek at around 14.00 so they'll be able to observe the orangutans more leisurely. Here's the trekking route to the feeding area. It gave me quite a turn to see an orangutan there! The guides told us not to hold high hopes in meeting Tom, the king of orangutans in Camp Leakey. But we were fortunate enough to see him. On the way to Camp Leakey, we met a group of visitors in kelotok boat leaving this area. Mr. Yusup told us that they had been staying there for a week, trying to make documentary movie about Tom. Too bad, they left just when Tom decided to show up. Ah, this is quite complicated. Let me try to explain. On the left you can see Siswi, former orangutan queen, in Kosasi's reign (the king before Tom). On the right, you can see Tut, Tom's mom, with her youngest son, Thor. There is a possibility that Thor is actually Tom's son. Siswi gave birth to once, and apparently she'd like to have more children but she had cancer and had to undergo a surgery. She can't have any more children and this seems to frustrate her. She sometimes helps other orangutan moms taking care of their babies and often stares at the babies longingly.